Mohamed Salah has undoubtedly set the Premier League alight since he joined Liverpool from Roma last season, but Pierre-Emerick Aubameyang is having a quietly brilliant time up front for Arsenal. 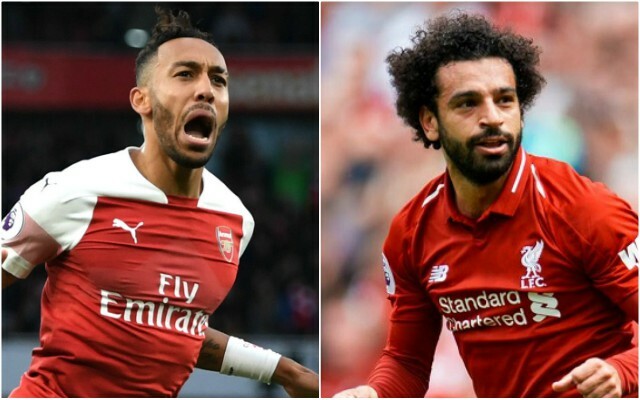 At the time of writing, the pair are joint-top scorers in the Premier League with 11 goals each so far this term, and it would not be too surprising if one of them were to end the season with the Golden Boot. However, one stat shows it is Aubameyang who may well be on course for the prize due to his incredible minutes-per-goal record. See below as this tweet from the Sportsman shows the 29-year-old is scoring a goal every 134 minutes on average – while Salah is actually third on that list with one every 144 minutes at the moment. Be the first to comment on "Proof that Arsenal striker Aubameyang is a better finisher than Liverpool goal machine Mo Salah"